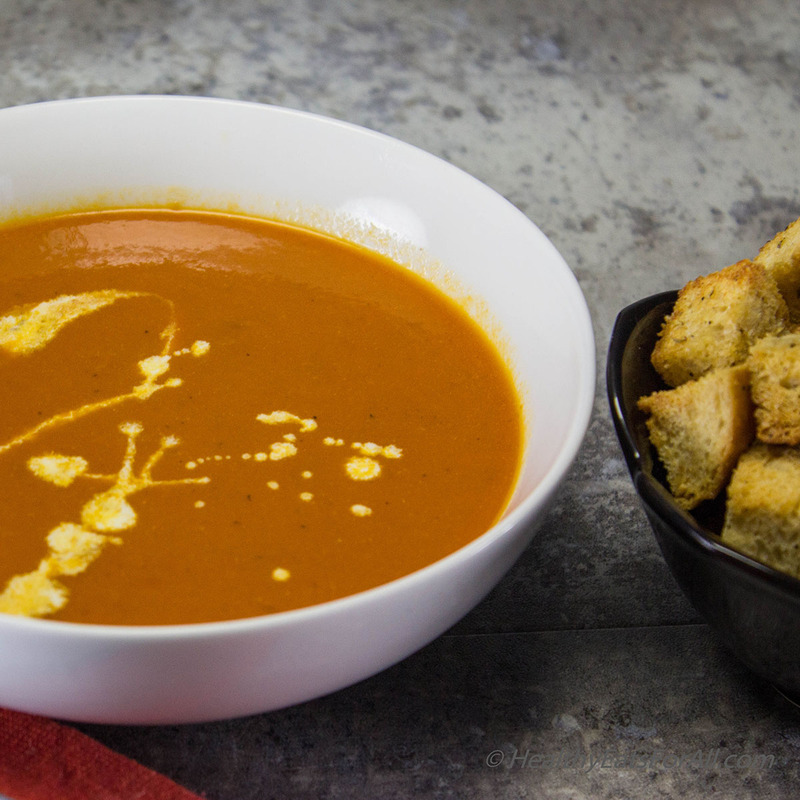 So I decided to make one of my favorite and easiest comfort soups, Tomato soup. 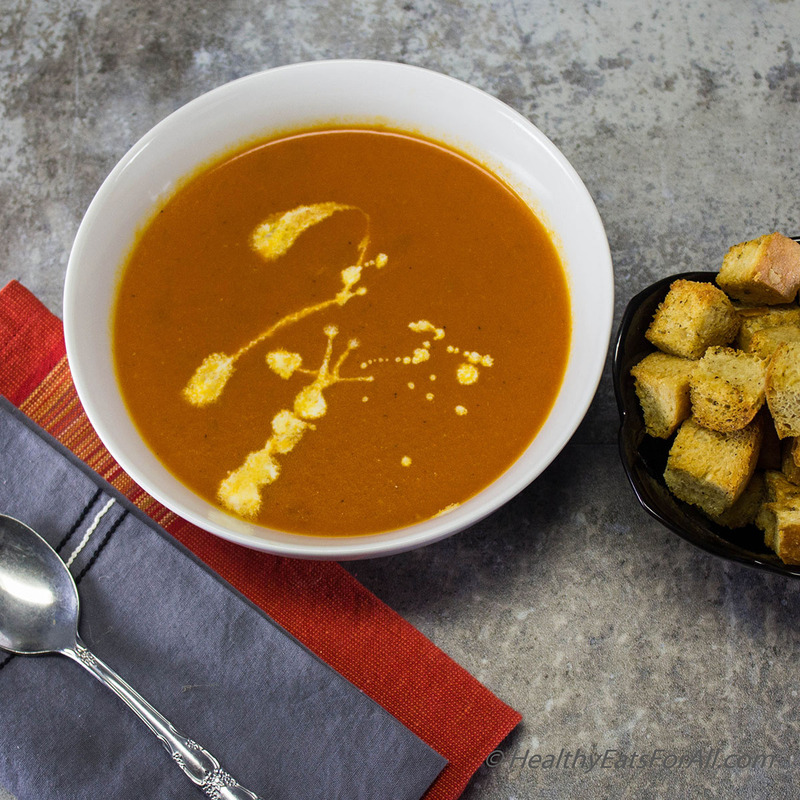 What would taste best with it…homemade croutons, of course! Even though I make the soup from scratch, it is ready in approx. 35-45 minutes, including homemade croutons. Plus, I usually make a large batch which is good for another couple of meals! Normally when you buy such a soup, it would have plenty of butter, cream, salt and sugar. But in this recipe I haven’t used any butter or sugar, very little salt and at the end it is absolutely optional to add the 4 Tbs. of milk or half and half for creamier, almost bisque like consistency. 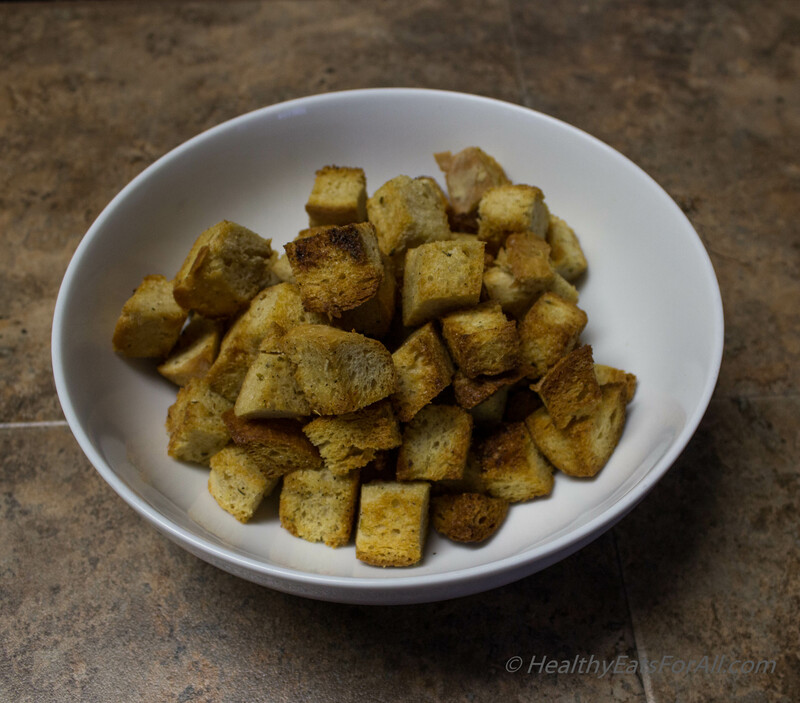 In order to make the croutons, I used 3-4 days old Italian bread. But if you don’t have that, you can use regular bread slices also. It is very versatile. Feel free to add grated parmesan cheese, red chili flakes etc. for extra flavor. 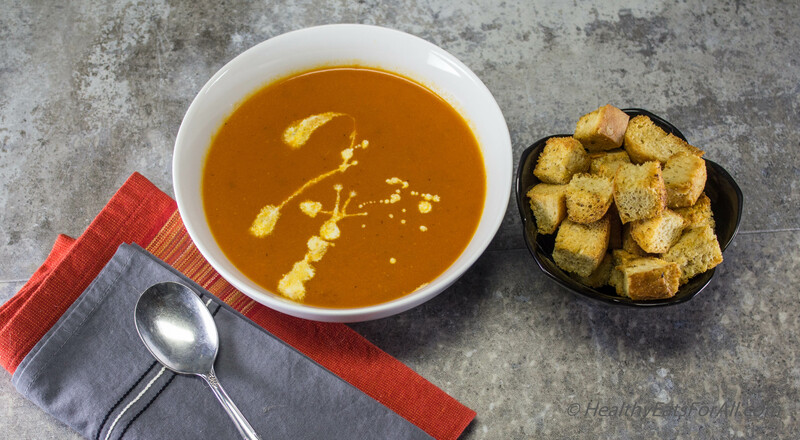 Not only does this soup taste delicious and has lots of vitamins A and C, it is also low in calories. 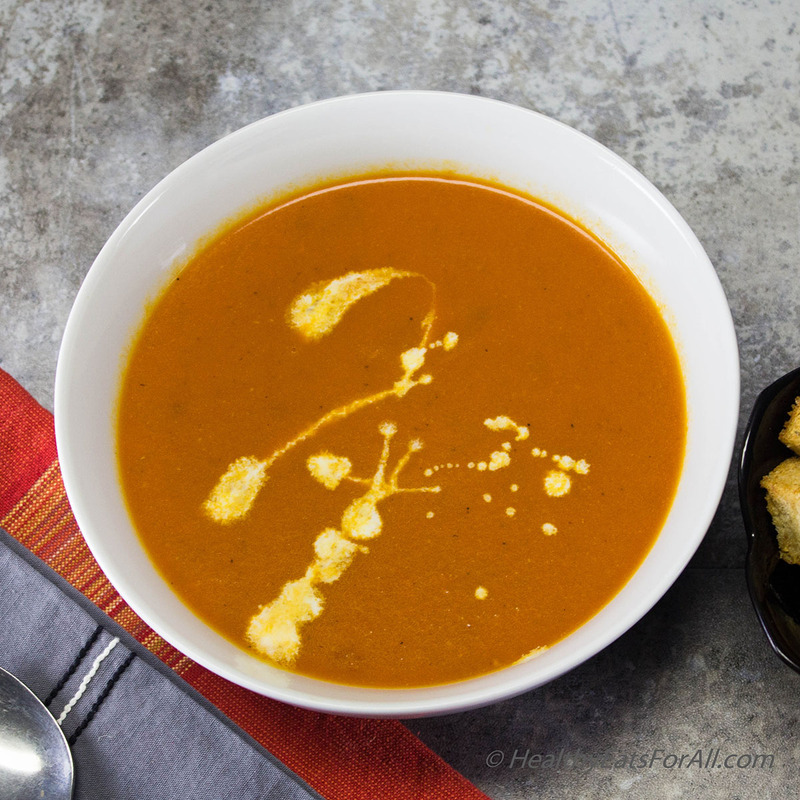 This soup will give the store bought soups a run for their money 🙂 Plus, you have the peace of mind knowing exactly what all went in the soup, and not some ingredients with long chemical names which one can’t even pronounce! Heat a pot. When warm, add the 1.5 Tbs olive oil. 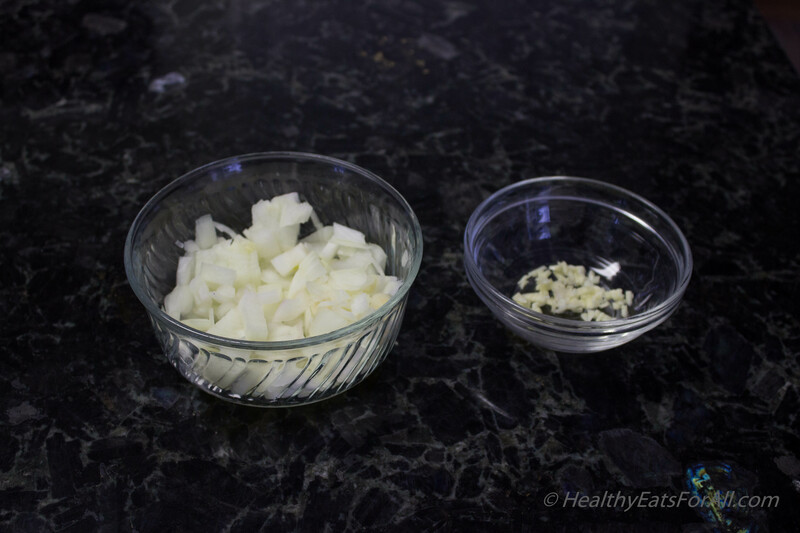 Then add the onion, garlic and bay leaf. Cook for about 5 minutes or so on medium heat till onions are translucent. Don’t brown them. Add the can of tomatoes and 2 cups of water, salt. Bring to boil. When it starts boiling, lower the heat to medium and let it simmer for 30 minutes. After that using an Immersion blender puree the soup in the pan itself. In case you don’t have an Immersion blender, use a regular blender to puree it. Then in the same pan heat the soup for 10-15 minutes. Add about 2-3 drops of Worcestershire sauce and black pepper. If you don’t have Worcestershire sauce, you can use vinegar or lemon juice. Add the half and half, or milk if you like the tomato soup to be a bit creamier. Otherwise just taste test for seasonings and enjoy with some fresh homemade croutons! (I made the croutons when soup was simmering. See the recipe below). 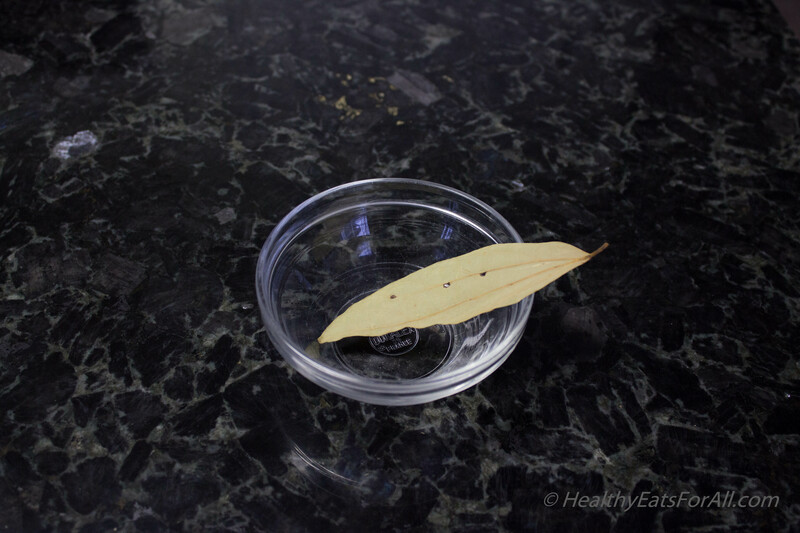 In case you think the soup is slightly tart, you can add ½ tsp sugar or honey. I prefer without it. Cut up the bread into cubes and put in a large bowl. Add the oil and all the seasonings and mix well with hands. Keep in oven for 10 minutes. Then take them out and flip them. Keep in oven for another 10 minutes or till crisp and crunchy. Thanks for sharing. I just make it today and I also added an egg, it tastes amazing!